So the sewing begins. During our recent move many treasures that were previously thought lost were newly discovered. The biggest treasure of all? All of my sewing things! 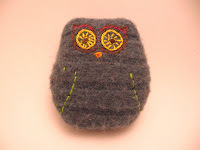 Thus these owls were created, they are made out of felted sweaters and they are oh so delightful!